US President George W Bush is likely to boost troop levels in Iraq next year, an administration official has said. Up to 25,000 more troops could be deployed to try to help end the violence, the official said, speaking on condition of anonymity. The comments come a day after prominent Republican John McCain called for up to 30,000 more troops to be sent to Iraq. Mr Bush had been due to announce a new strategy on Iraq next week, but has delayed his speech until January. He is holding a flurry of meetings with top US and Iraqi officials and experts on how to change his policy. 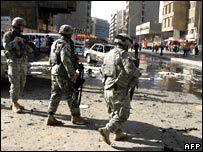 In Iraq, the country's biggest humanitarian organisation has accused US troops of attacking its offices and vehicles. The Iraqi Red Crescent's vice-president said attacks by US-led forces were the biggest problem it faced. The US military said it was checking the allegations. To tackle the militias behind much of the sectarian violence in the country, but especially the capital. The remarks appear to be setting the tone for Mr Bush's announcement of his new Iraq strategy, our correspondent says. He says the idea of boosting troop levels for one final push at halting the spiralling violence has been much discussed in Washington recently. The comments came a day after Senator McCain called for more troops to stabilise Iraq. "The situation is very, very serious," he said in Baghdad. "It requires an injection of additional troops to control the situation and to allow the political process to proceed," he said. There are currently 140,000 US troops in Iraq. Since a high-level review group published its findings last week, President Bush has been consulting with his military commanders and Iraqi political leaders to shape a new strategy. Military commanders, however, have been expressing scepticism that extra troops on their own will have much effect, our correspondent says. They say that stability in Iraq can now only be had by political means. 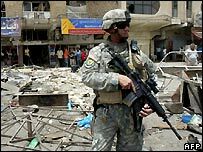 The Iraq Study Group, composed of top Democrat and Republican legislators and experts, said combat troops could be withdrawn from Iraq by early 2008. They said the current US strategy of "staying the course" was no longer viable. On Wednesday, Mr Bush said he would not be rushed into making "a difficult decision". "I've heard some ideas that would lead to defeat. And I reject those ideas, ideas such as leaving before the job is done; ideas such as not helping this government take the necessary and hard steps to be able to do its job."